Lichens are intriguing composite organisms formed through symbiosis between fungi and cyanobacteria/algae. Like plants, lichens photosynthesize and - also like plants - they flourish here at the Garden! While lichens can be found throughout the year, they are particularly striking during winter months. As days grow dark and damp, lichens illuminate bare branches, weathered fences and wet boulders. These living ornaments are worth pausing to appreciate as you explore the Garden. To date, this fascinating component of the Gardens diversity has not been surveyed. On Saturday, January 20th, we will inaugurate this effort with the UCBG Lichen BioBlitz. 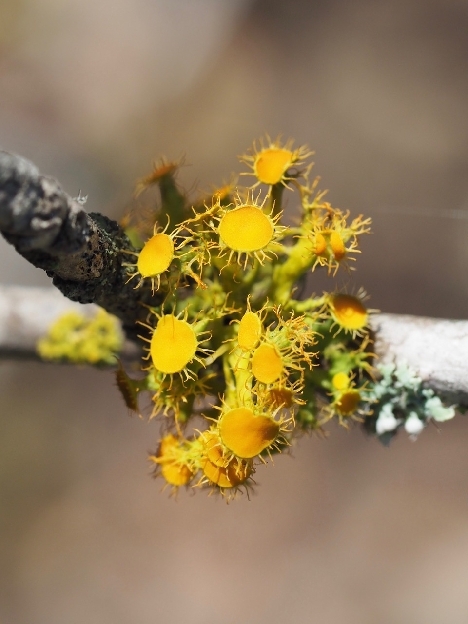 We invite you to join lichen experts, UCBG faculty, Garden staff and citizen scientists for a lichen treasure hunt. During this one day event, participants will work in teams to document the lichen diversity at the Garden. Even if you have no specific lichen expertise, your participation is welcome. A keen eye and willingness to work collaboratively will help insure a thorough survey. Participants are asked to pre-register and attend an orientation session the morning of the event.